Wedding at Lekha Farm is a truly unique and memorable experience, capturing the natural beauty of the park and adding a twist of Pune City’s style and flair creates the perfect ambience. We offer the best high class environment with efficient staff, backup light facility, stage facility, modern buffet table, bridal AC room…etc. We provide very attractive stage decoration. It is an ideal choice for all special occasions. 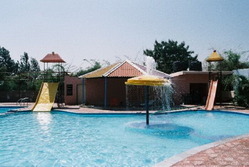 An open-air swimming pool welcomes you to soak in the energies from the sky above. Let the water gently caress your body. Swimming is so good at helping us relax because it uses all the major muscle groups - a demanding aerobic exercise that helps to keep your heart and lungs healthy. Regular swimmers won't want to miss out on the usual morning swim, and for those who don't have the opportunity to get to the pool regularly, enjoying a swimming pool as part of your weekend activity is an opportunity not to be missed! The ancient princely state of Rajasthan gave rise to a royal cuisine. Their food cooked in pure ghee is famous for its mouth-watering aroma. Rajasthan's tastiest curries are based on the use of pulses or gram flour. Dry fruits, spices and yogurt are used in many delicacies. 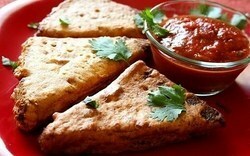 Rajasthan can also boast of a vast array of savouries and sun-dried snacks. Be it dal baati and churma or missi roti , one always ends up licking his fingers. Your tummy will scream "No more !" But you won't stop !!! 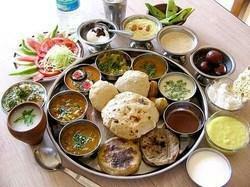 Gujarati Cuisine has special place all over India. 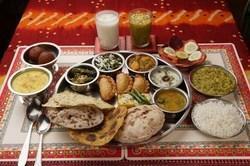 Gujarati cooking consists of dal, bhaat (rice), vegetables, chapatis, kachumbar (mixed vegetables salad), papad and curd. 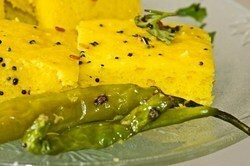 Gujarati food is nourishing and balanced. Snacks like dhokla, khandvi, sweets like basundi are famous for its taste. Snacks are always delicious and mouth watering. Tempting savories like samosas, chats, pakode etc. are commonly served. The crispness and tempting tastes of snacks is liked by young and old alike. 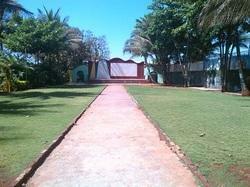 The Lekha Farms is the perfect place for corporate outdoor trips. We conduct team building exercises. 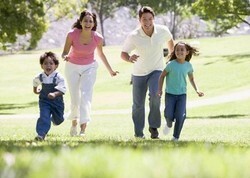 Our specially made ‘leadership development program’ helps people work together effectively and efficiently. 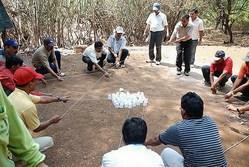 Apart from these activities office groups can enjoy the nature and trek nearby hills while their stay at Lekha Farms. Maharashtrian or Marathi food consists large variety of vegetables, fish and coconuts. Maharashatrian food is rich in ginger, garlic and lots of spices. Tomatoes, brinjals and other vegetables stuffed with masala fillings and cooked in oil. Cooking is mainly done in groundnut oil. Bharwan Baingan, Kohlapuri Rassa, Puran Poli, Aamti, Bombay Chiwda are some of the popular recipes. 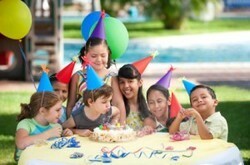 Planning an outside birthday party for your near and dear ones; probably springs from the idea of providing your guests with something different than what most party throwers provide. An outdoor party at Lekha Farm is fun and memorable as we plan it perfectly, considering the number of guests and your requirements. Let’s together make it an awesome memory for your guests.